I’ve never baked croissants in my kitchen, I’m a bit scared of puff pastry at least when I’m the one who has to prepare it. Unfortunately, I love to eat them, sometimes I literally crave their buttery flakiness that leaves your fingers sticky and fills your mouth with the wonderful taste that only the excessive use of butter can create. 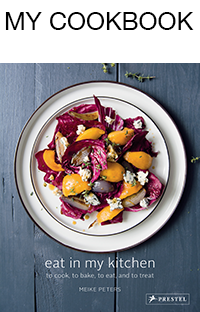 Luckily, there is an easier and quicker alternative to the French treat coming from the Jewish cuisine. 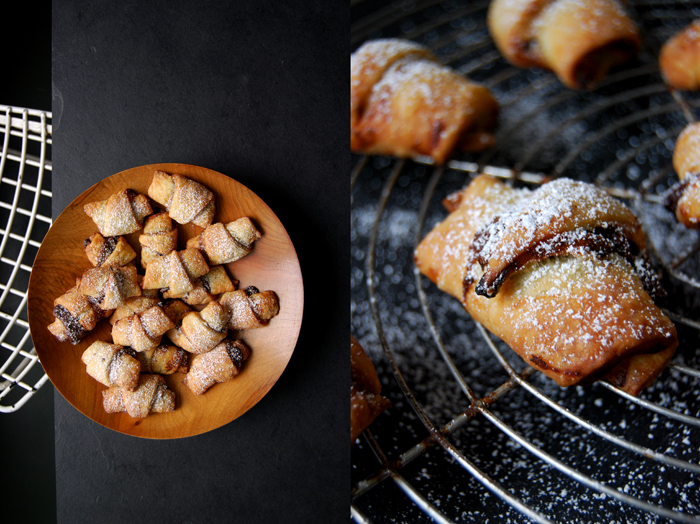 In case of urgent need of croissants, just bake rugelach! The delicate pastry is in no way behind croissants, neither in richness nor in tender lightness. It’s the addition of cream cheese that creates this easy miracle, easy as it’s far from being as time consuming as the French breakfast classic. When the ingredients are mixed and the dough has cooled in the freezer for half an hour, the rolling and filling can begin! 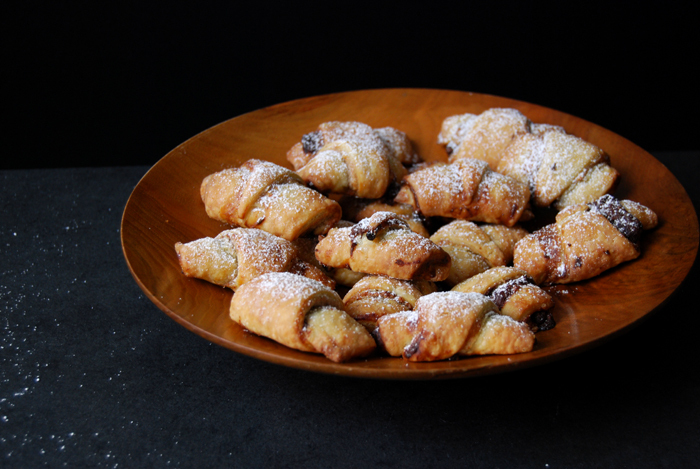 My last rugelach recipe was one of the first posts I shared on eat in my kitchen, I baked them for a festive Hannukah party at a friend’s house. I used bittersweet chocolate and cinnamon, a combination that can never go wrong. 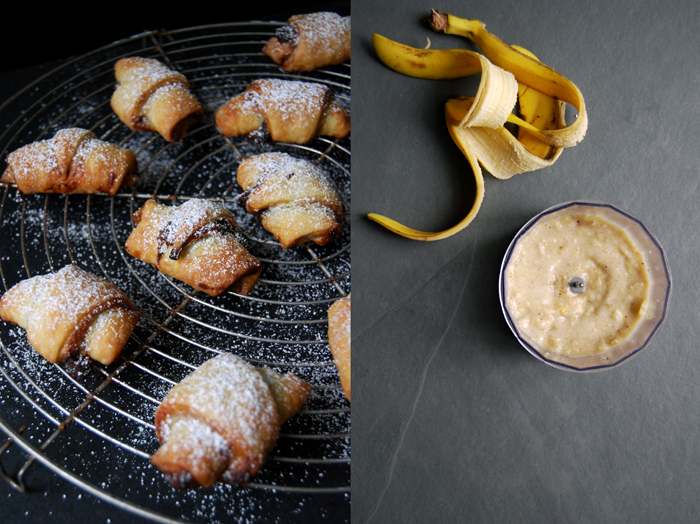 For my new recipe I had a bit of a childish combination in mind, chocolate breakfast spread and puréed bananas, the perfect kiddy treat! I’m quite sure that a few of our friend’s young children would have loved to join in my messy kitchen activity. 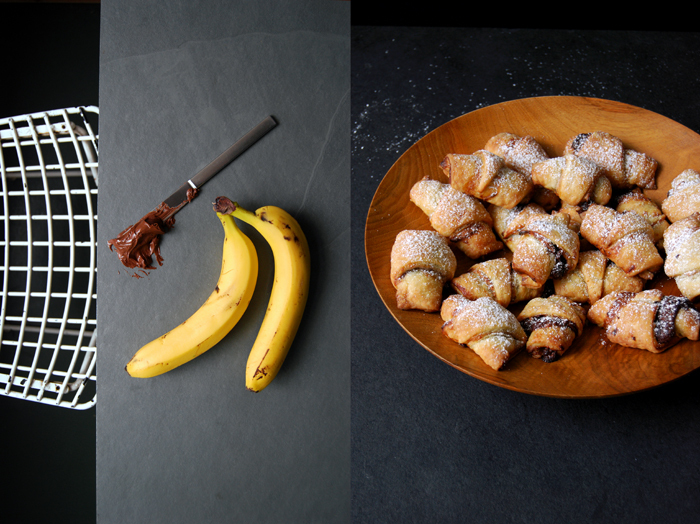 My first batch of rugelach turned out to be a bit difficult as I tried to cut the single pieces after I spread the banana and chocolate on top of the pastry, messy! I can’t recommend this, it’s almost impossible! 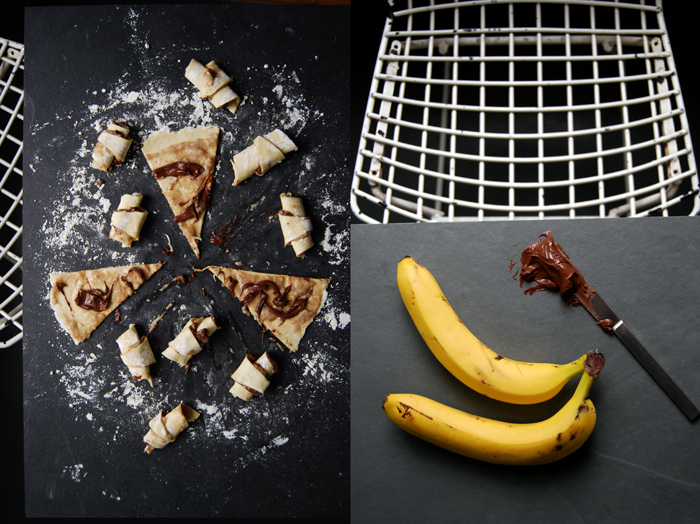 Instead, start with the banana layer, cut the triangles and then put on the chocolate spread, that’s much easier. So, what can I say about the taste? 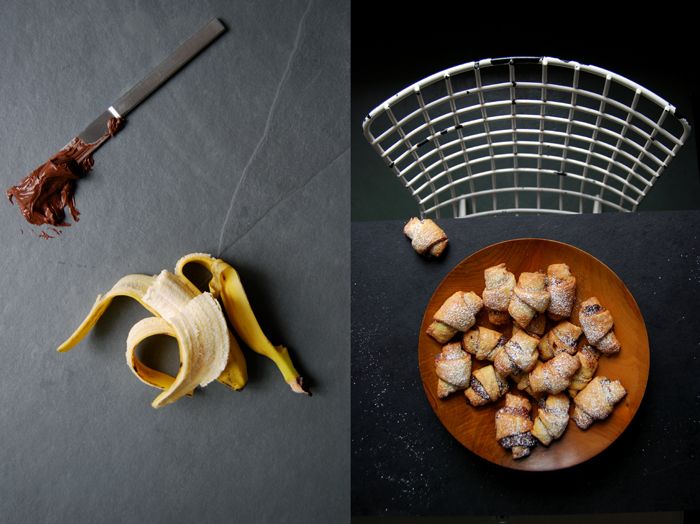 My partner was quite sceptical when I told him about this combination but then, as soon as he smelled the sweetest aroma coming out of the kitchen, he couldn’t stop himself anymore. Both of us actually, as we ate them like peanuts. It’s one of those sweets that hits the right spot with the first bite and calls for more and more! Combine the flour, icing sugar and salt. Cut the butter with a knife into the flour mixture until there are just little pieces left. Continue with your fingers and work the butter quickly into the flour. Add the cream cheese and continue mixing with a fork or the hooks of the mixer until the mixture is combined. Form 2 discs, wrap them in cling film and put them in the freezer for about 30 minutes, the dough should be hard but still rollable. Set the oven to 185°C / 365°F and line a baking sheet with parchment paper. Purée the bananas in a food processor until smooth. When the dough is hard, keep one disc in the fridge and roll out the other disc between cling film dusted with flour. You should end up with a circle of about 30cm / 12″. 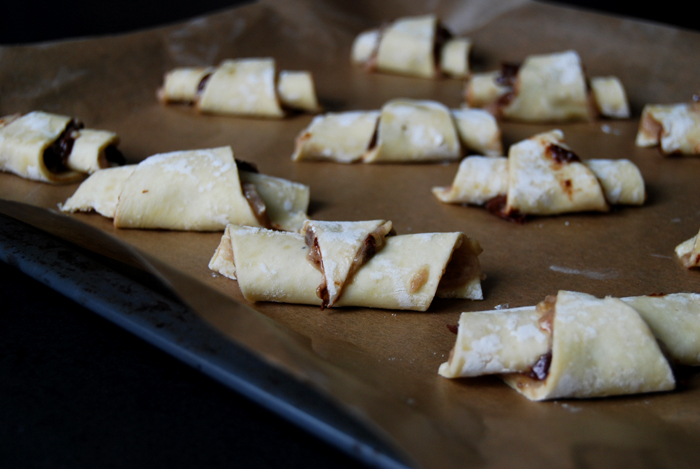 Flip the dough onto a new piece of floured cling film, this will make it easier to roll the rugelach. Spread half of the banana purée on the dough and cut it like a cake into 12 triangles. Divide half of the chocolate spread roughly into 12 portions and sprinkle on each triangle. 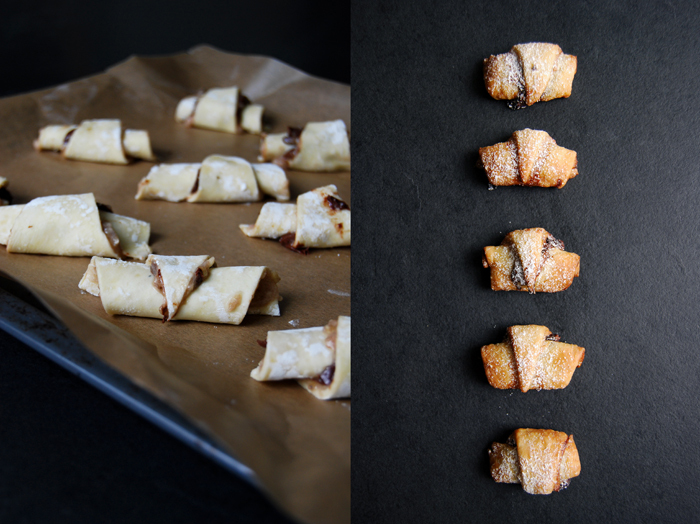 Gently roll up the rugelach from the wider side to the tip. Bake in the oven for about 19-20 minutes or until golden brown. Continue with the remaining disc. 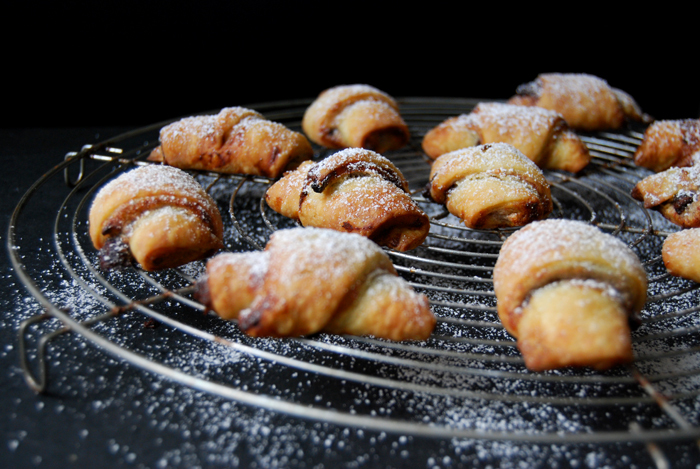 Let the rugelach cool on a wire rack and dust with icing sugar.